Movies like this one don't come along very often. I wouldn't go so far as to call this one of my favorites of all time, but it's certainly one of the best movies that has come out this year. Much like Rise of the Planet of the Apes, the story focuses on Caesar, who is now the leader of a whole society of intelligent primates. It's been ten years since the events of the last movie, and during a montage at the beginning of the film we learn that the retrovirus that gave Caesar his mind has now killed off almost the entire human population. To be clear, this is a pretty dark and mildly unsettling movie, but not in a bad creepy horror movie way. Movies that deal with an apocalyptic scenario this well inherently have some darkness in them. Everything feels inevitable; the conflict between human and ape is one of those things that almost has to happen. Except that's the point. Peace is possible, if we can somehow bridge the gap between our species. It doesn't seem implausible, because we get to understand the apes in a way I didn't think was possible. The entire movie hinges on the believability of the ape characters, many of whom are recognizable from Rise. The personalities of the individual apes were obviously given a lot of thought and attention, so that we can at a glance know which ape is which, and what their motivations are. That's impressive for a group of characters made up entirely of CGI. Actually, the CGI was so impressive that I often forgot the apes weren't real. As for the plot, it was intelligent and well thought out, based on character actions instead of plot contrivances. Misunderstandings, betrayals and hatred escalated the situation to a point where even the moral characters had to make hard choices. Whereas most movie plots might have normally gone left, this plot turned right, and that kept me guessing. I was engaged and tense throughout, wondering which character I liked would make it out alive. There was also quite a bit of action, and that action was really incredible to watch. It wasn't just explosions and gunfire, which did feature an ape on horseback wielding machine guns, though. It was more intimate than that. By the time we got to the action there were characters we cared about, and every injury and death felt important. That probably had a lot to do with the acting, both the motion capture performances and the live action ones. 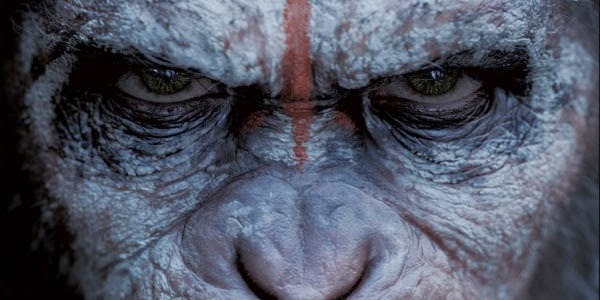 Andy Serkis (Caesar) is the lead here, and he dominates every scene he's in. His presence is so powerful that it is clear why the rest of the apes follow him so loyally. Thankfully the human characters are also rather good, and their interaction with the apes sells the special effects completely. Specifically Malcolm (Jason Clarke), and Ellie (Keri Russell), who interact with the ape characters the most. Perhaps the my favorite stand out character that propels the plot forward is Koba (Toby Kebbell), a scarred former lab chimpanzee who has understandable reasons and real motivations for his actions. He is a morally gray character, and I could even sympathize with him to a point. His human counterpoint is Dreyfus (Gary Oldman) who seems like a fairly archetypal character, but he doesn't do the things that kind of character would normally do. I guess my point is they weren't caricatures who made illogical choices because the plot demanded them. They felt like real people with emotional baggage trying to struggle through those issues and not always succeeding. I should also mention the set design. It struck me as incredibly subtle and stunning how well the ape village was realized. From the imposing entrance to the main gathering area, it felt like an primitive, but intelligent group put it together with their bare hands. There was even a classroom with one of the most important tenets of ape society written on the wall; "Apes do not kill apes". It not only informed the viewer what Caesar had created in those ten years since the last movie, it was a logical place to put that sentiment, where ape children would see it everyday. In practically every way this was a superior movie to Rise of the Planet of the Apes, which I considered one of the best movies of that year. After Rise, I had hoped but wasn't sure if this rebooted series was going to work in the long run. After seeing this one, I think the legacy of the original Planet of the Apes has been passed on in the best possible way.